Sorry for lack of Kitsuo IDs, I don't have a computer right now and I can't get the Kitsuo API search to work (it tries to download a file and fails when I go to the page). @Paulo27 Thanks, I added most of them now. I couldn't find any releases for these episodes. Are they only available as RAW? I couldn't find any releases that would require these rules. 2nd Season's episode 0 (Hero Note). It's in my post above. Saenai Heroine will only be out on the 7th but there's no reason why it won't be labeled as episode 0 like the previous season which also had an episode 0 is already available. The others are raw-only, yes. Gin no Saji is also a raw only release (ReinForce I believe), given that it's split cour too I think it's a good idea to have it. Yurumates is also raw only (please include ! in its rule). This one might not be as necessary though.
? In case people add the necessary alternative title to the second entry. This shouldn't interfere with the other rule. EDIT: Actually, that's what a ! would do, isn't it? Adding ! to the first rule should solve that issue. could also have ! added for the same reason. I was gonna say it was weird Taiga couldn't recognize [FFF] Saenai Heroine no Sodatekata Flat - 00 [D2861769].mkv even though it was recognizing it under the correct title (Saenai Heroine no Sodatekata Flat) but I'm pretty sure it's because Saenai Heroine no Sodatekata Flat hasn't aired yet, which is getting in the way of Taiga redirecting to episode 0 correctly. I never noticed this before since the relations are usually added after the show started airing already and while it's relatively minor, relation redirects could probably ignore the rule that an anime isn't recognized if it hasn't aired. And upon further inspection, it's best not to add the Flying Witch Petit Special rule. The episode 10 in the releases that have it is not actually the Special but the commercial, which is episode 5.5 and is included in the Flying Witch Petit entry, it seems the Special is episode 9 in those but a rule for that can't be made. Anyone can tell/teach me how to edit the directory for a player .exe file? The player in question is MPC-HC which taiga doesnt recognize even though it is installed. Maybe because it's a "modded" version from kawaii codec pack? im in W10 x64 if that helps ! I don't think this file gets rewritten when you restart Taiga so it should be fine to change the directory there. Thank you very much! I've managed to make it work... er...halfway. Now the Media Player Classic - Home Cinema has a blue icon, ticked, and it opens the executable file. Enable Media Player detection is also ticked. Streaming media is off. both files is under their folder under the folder named Anime. Now scan (now playing) indicates I have only 1 video in the library. trying random it plays SukaSuka ep1 using MPC-HC but taiga doesnt recognize it is a file is being played. so basically directory & player recognition problem. Am I doing something wrong? Maybe conflicting settings? I really love this app. That's why I want it to work out. By "recognize" do you mean it doesn't detect the video at all? Can you take a screenshot of the Now Playing tab while the video is playing? 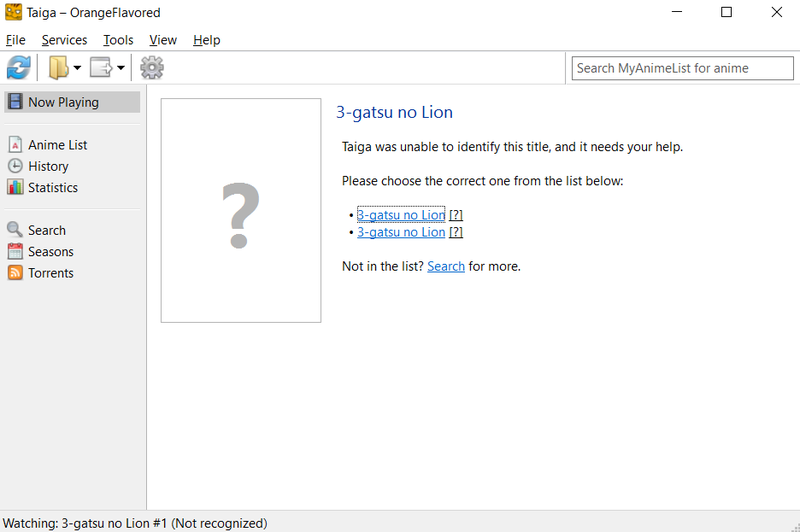 Also, Taiga will only scan for things in your library folders (even if "Ignore files outside of library folders" is off), so add the folder "Anime" to your library folders for Taiga to scan all the files there. You can for force a rescan by pressing F5 while in the Anime List tab. the unfoldered ones where downloaded by idm but i don't count them. is that how taiga now playing supposed to be when a file plays? if it is, then forgive my ignorance. I used to stream and i used to use taiga to update eps on mal. You don't the first episode of Oushitsu watched so it won't display there. What version are you using, for reference? I'd also suggest trying an older one to see if that solves it. i included vlc on recognized players. maybe new versions really broke things, what version do you suggest I try? Vlc is in default directory and untouched by anything so I thought it should be fine but it still doesn't. if all else fails, maybe I'll try again when I do a OS reinstall, test it with vanilla MPC and VLC including old versions. Did not know until now that seasons can be updated using the software update, mine was stuck with summer 2016 wondering how to update it. Guess tinkering things around paid after all. Thank you very much for all of the help and being patient with me, I really appreciate it. Hello, it seems Taiga have problems with recognizing latest two versions (1.7.1150 & 1.7.1915) of Potplayer. Everything worked fine until last month. Cheers and thanks for this great piece of soft! Don't have a computer right now so can't really tell you what versions might work. I'd suggest you try to install KCP instead of vanilla MPC-HC though, if that doesn't work, at that point it's probably a OS issue. Don't forget to change the path in the media.xml file if you need to. Also, VLC might not have worked there because you had MPC-HC already open (though if MPC-HC doesn't work it probably wouldn't get in the way, not sure). I think this does cause an issue of possibility getting some releases wrong. What's the best option in this case? But I checked the releases available and there doesn't seem to be one that uses "Magic Knight Rayearth II - 01" for episode 1 of S2. Only "Magic Knight Rayearth II - 21" or "Magic Knight Rayearth - 21" for that same episode. So this one shouldn't be an issue. I also checked the other relations and there doesn't seem to be any that's affected by this. You're saying nothing shows up in the Now Playing tab when you play them? Shows up when I do the first one. Any future ones show up fine. Also if I try to double click when it's on the first episode it will fail to find it. This seems to be an issue with duplicate entries for some reason. What happens when you click the [?] in each of those? If they open windows can you click the images and note the URLs of the pages that open? Also, deleting %appdata%/Taiga/data/db/anime.xml should fix this issue (keep in mind that by doing this you'll lose all the anime data you have saved, stuff like the MAL scores will be reset), I'd suggest backing up before removing it. Anyways since it is only a handful of shows I will ignore it for now. You can always find the shows in the anime.xml file and delete them manually though that might be more troublesome. Also, if you simply pick the entry in the Now Playing tab, the problem will go away anyway. I'd still be interested in seeing what anime shows up when you press the [?] icons. This is what the second one was. First one was the correct entry for the show, picking that seems to have fixed it up. Also looks like for Gangsta it couldn't tell if it was the show or the recap. @OrangeFlavored This is actually the intended behavior rather than a bug, although it might still be considered an issue. See this page for more information. In your case: "3-gatsu no Lion - 01" can be either this or that. "Gangsta - 01" can be either this or that. Yeah, seems that way now that I know what's actually causing it. Just confused me a bit at first due to only affecting the first episode of some shows. Though I would suggest that if Taiga is searching for something and the only result is an ambiguous one, you might want to load it rather than say you found nothing. At least if there is only one potential match... Or maybe have the program try to match the second episode if it can't find the first one (since it seems that is where these kinds of collisions happen most) and then count backward or something. So, what about new pot player recognition? Can you check what's wrong? Of course I could manually set alternative names for that shows including that information but that's kind of time consuming to do on every single show I'm watching. May 5 edit: [Coalgirls]_Durarara! !_12.5_(1920x1080_Blu-ray_FLAC)_[C7E82EC9].mkv does not get detected properly as the first special, in fact Durarara Specials doesn't even show up as a possible choice even though Durarara!! Episode 12.5 is set as an alternate name. The second one (episode 25) does get recognized properly though. It seems like Taiga for me no longer recognizes any steaming media through firefox. I have no clue as to why, Seems to work fine through chrome. I have same problem with Firefox, too. All of the other episodes are fine, except episode 7 which also begins with "A" and thus has the same problem. I just noticed something - the function "view anime information" stopped working completely. It is grayed out for every single torrent, even the ones with exact same names as listed on MAL, in which cases it would be just a 100% match, still doesn't show even those. Why is that? Is the square before the title grey? If so it means Taiga isn't associating that title to any entry. This is likely an issue with your files. Did you move the Taiga installation folder to somewhere outside of the default (%appdata%/Taiga)? If you installed it somewhere else try to run Taiga as admin. Try to restart Taiga and right-click the torrent > Search for anime with this title and refresh the torrent feed and make sure the title is exactly the same or add that title as an alternative title. Didn't really do anything with it before the problem appeared. Although after I relaunched it and updated the list now it started working again, so at least it was not permanent. Still missing more than half the titles though. I am using SMPlayer 17.2.0 with SVP and get no recognition at all. I don't know whether or not this has been addressed or not, I find this forum impossible to search. I am using Kodi DSPlayer as well and taiga pulls off recognition just fine with that. 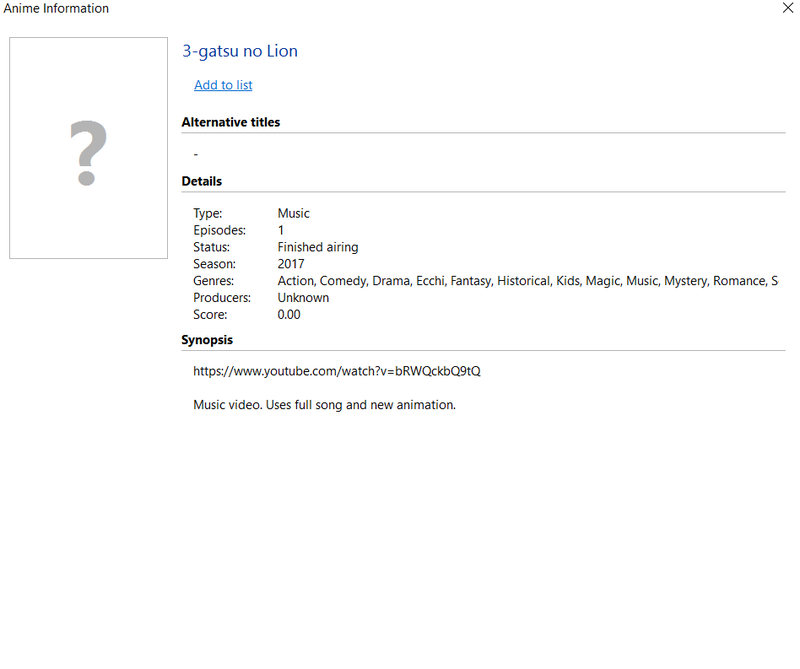 Taiga shows this torrent as batch of all 12 episodes, but it's still ongoing, and batch has only 3 epidoses. This is the torrent's fault for not including the episode range in the name. Taiga has no way to tell if that person isn't a time traveler. I accidentally clicked on the wrong title for an anime on the NOW PLAYING page. Now I can't find a way to change it. Is there a way? Simply edit the alternative title of the entry you selected. @Paulo27 IIRC I didn't add it before because the specials aren't actually episode 14 and 15. The first special ("Stairway to Heaven") is episode 4.5, and the second special ("Hell's Kitchen") is episode 2.5. Hm, I think I remember something to that effect, but I was rewatching and the release I found had the first one as 14, though on second look, it doesn't look like that popular of a naming scheme for the OVAs since I can't see anyone that named the second 15 (seems like Doki, Coalgirls, E-D, and some other minor groups did use 14 for the first one, and I thought I had downloaded one that used 15). I seem to have issues with the new season of Hero Academia. Eariler it didn't detect anything to download, and now (might have been when I tried to add a name to it) it finds all episodes from eariler season instead. Don't add an alternative title, you'll confuse Taiga. Try to search for updates and remove the title and it should recognize the new season properly now. Tried it, still shows up in the same way. Can you post the filenames? For anyone having recognition issues, disable "Ignore files outside of library folders" under the "Validation" section under the "Recognition" tab. Recognized as a bug via github issue #556. Marked for fix in 1.3.1. Seems like the previous name I set for it still applies, even if it's empty. Edit: Oh.. rest arted Taiga, seems to have solved the issues. Will see for sure next time an episode is released.